A cost-effective range of multi-purpose systems combining Grant's legendary quality and reliability. Precise temperature control for a wide range of laboratory applications. Grant stirred baths and circulators provide a source of precision heating and cooling for many routine and sensitive analytical procedures including sample incubation, calibration and quality control testing. All models from the TC120 upwards are suitable for use as both open and closed loop circulators (i.e. remote vessel open or closed). Any of the four Grant Optima digital thermostats can be combined with any of eight Grant tanks (five stainless steel and three plastic) to provide a choice of 32 models. Grant T100 series systems offer a choice three economy plastic (P) tanks or five stainless steel (ST) tanks with different capacities combined with the Grant Optima T100 digital thermostat for accurate temperature control. The Grant T100 immersion thermostat incorporates Intelligent Control Optimisation(ICO) for adaptive intelligent PID temperature control and includes a powerful integral pump, making T100 systems suitable both for immersing samples and circulating temperature controlled fluid to external devices. Grant TC120 series systems combine the versatile Grant Optima TC120 digital heating circulator with a choice of three economy plastic (P) tanks or five stainless steel (ST) tanks with different capacities. The Grant TC120 heating circulator incorporates Intelligent Control Optimisation(ICO) for adaptive intelligent PID temperature control and includes a powerful integral pump, making TC120 systems suitable both for immersing samples and circulating temperature controlled fluid to external devices. It includes a convenient timer function for reaction timing and a variable high temperature alarm setting. The temperature range and heater power are automatically limited according to the liquid type selected. The Grant Optima TX150 series of digitally controlled heated circulating baths provides outstanding performance for routine and sophisticated applications requiring accurate temperature control up to a maximum of 150°C. 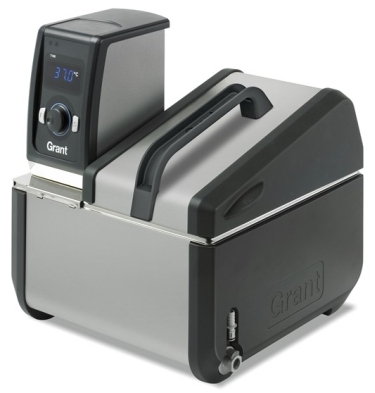 Grant TX150 series systems combine the powerful and versatile Grant Optima TX150 digital heating circulator with a choice of three economy plastic (P) tanks or five stainless steel (ST)tanks with different capacities. The Grant TX150 heating circulator incorporates Intelligent Control Optimisation (ICO) for adaptive intelligent PID temperature control and includes a powerful integral pump, making TX150 systems suitable both for immersing samples and circulating temperature controlled fluid to external devices. The temperature range and heater power are automatically limited according to the liquid type selected. The TX150 control unit has a host of powerful and convenient programming features for optimum application flexibility. These include a convenient heater timer for early starts/late shutdowns, a programmable relay for switching external devices on/off, option for remote temperature monitoring, USB interface for PC communication and data collection, and memory capacity for one program of up to 30 segments. The Grant Optima TXF200 series of digitally controlled stirred heated circulating baths provides outstanding performance for routine and sophisticated applications requiring accurate temperature control up to a maximum of 200°C. Grant TXF200 series systems combine the powerful and versatile Grant Optima TXF200 digital heating circulator with a choice of three economy plastic (P) tanks or five stainless steel (ST) tanks with different capacities. The Grant TXF200 heating circulator incorporates Intelligent Control Optimisation(ICO) for adaptive intelligent PID temperature control and includes a powerful integral pump, making TXF200 systems suitable both for immersing samples and circulating temperature controlled fluid to external devices. The temperature range and heater power are automatically limited according to the liquid type selected. The TXF200 control unit has a host of powerful and convenient programming features for optimum application flexibility. These include a convenient heater timer for early starts/late shutdowns, a programmable relay for switching external devices on/off, option for remote temperature monitoring, USB interface for PC communication and data collection, and memory capacity for 10 programs of up to 100 segments each.